Not to be confused with Gareth Evans (director). Gareth James Edwards (born 13 July 1975) is an English film director, film producer, screenwriter, cinematographer, production designer, and visual effects artist. He first gained widespread recognition for Monsters (2010), an independent film in which he served as writer, director, cinematographer, and visual effects artist. He subsequently directed the 2014 reboot of Godzilla, and the film Rogue One: A Star Wars Story (2016), the first in the Star Wars Anthology. 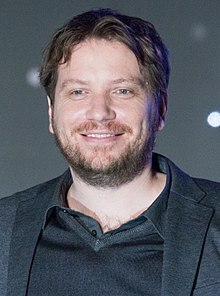 Gareth Edwards was born on 13 July 1975 in Nuneaton, Warwickshire. He is of Welsh parentage. He attended Higham Lane School. Since childhood, he wanted to direct his own films, stating that "Star Wars is definitely the reason that I wanted to become a filmmaker". Edwards studied film and video at the Surrey Institute of Art & Design in Farnham, graduating in 1996. In 2012, he received an honorary Master of Arts from UCA. Edwards got his start in visual effects, creating digital effects for prestigious shows such as Nova, Perfect Disaster and Heroes and Villains, the latter of which a series for which he made 250 visual effects which won international recognition. In 2008 he entered the Sci-Fi-London 48-hour film challenge, where a movie had to be created start-to-finish in just two days, within certain criteria. Edwards won the contest and went on to write and direct Monsters, his first feature. Edwards personally created the visual effects for Monsters using off-the-shelf equipment. Besides the two main actors, the crew consisted of just five people. The success of Monsters brought enough awareness in Hollywood to land Edwards a few major projects. After the film's release, he did interviews in Hollywood with several studios, including Legendary Pictures. In January 2011, Edwards landed his first major Hollywood feature, as the director of the 2014 Godzilla reboot from Warner Bros. and Legendary Pictures. Edwards directed Rogue One, the first Star Wars stand-alone film, written by Chris Weitz and Tony Gilroy, based on a story by John Knoll and Gary Whitta, starring Felicity Jones, and released on 16 December 2016. Three of his influences for filmmaking are George Lucas, Steven Spielberg and Quentin Tarantino. In May 2016, Edwards exited Godzilla: King of the Monsters in an amicable split with the studio to work on smaller scale projects. 2008 Heroes and Villains Episode "Attila the Hun"
^ Clarke, Cath (23 September 2010). "First sight: Gareth Edwards". The Guardian. Retrieved 4 January 2011. ^ Davis, Laura (2 December 2010). "Interview with Gareth Edwards, the Director of 'Monsters'". The Independent. Archived from the original on 11 December 2010. Retrieved 4 January 2011. ^ "Godzilla and Star Wars director Gareth Edwards". Wales Online. 27 May 2014. Retrieved 27 May 2014. ^ Hopkins, Jessica (27 February 2011). "The film that changed my life: Gareth Edwards". The Observer. Retrieved 17 November 2011. ^ Rose, Steve (27 November 2010). "Monsters: the bedroom blockbuster that's the anti-Avatar". The Guardian. Retrieved 17 November 2011. ^ "Godzilla: Meet The Director". Youtube. Retrieved 10 April 2014. ^ Kit, Borys (4 January 2011). "EXCLUSIVE: 'Monsters' Director Stomps to 'Godzilla'". The Hollywood Reporter. Retrieved 17 November 2011. ^ Kit, Borys (22 May 2014). "'Star Wars' Spinoff Hires 'Godzilla' Director Gareth Edwards (Exclusive)". Hollywood Reporter. ^ "Rogue One is the first Star Wars standalone film, Rian Johnson to write and direct Star Wars: Episode VIII". Star Wars. 12 March 2015. Retrieved 15 March 2015. ^ Jagernauth, Kevin (1 May 2014). "Gareth Edwards Names His 3 Filmmaking Heroes Plus New 'Godzilla' Featurette Goes Behind The Scenes". Indie Wire. ^ Fleming Jr., Mike (13 May 2016). "Director Gareth Edwards Exits 'Godzilla 2'". Deadline Hollywood. Retrieved 13 May 2016. 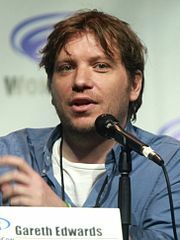 Wikimedia Commons has media related to Gareth Edwards (director). Factory Farmed, winner of the Sci-Fi-London 2008 film festival 48 Hour Film Challenge, on Dailymotion. Gareth Edwards: Indie Filmmaker, See how Gareth created his independent film with "pro-sumer" equipment.